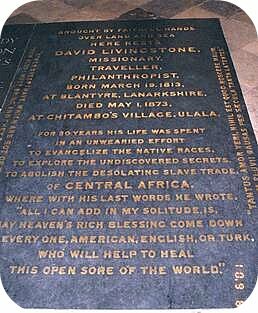 After the death of the celebrated African explorer Dr Livingstone in May 1873, his embalmed body, wrapped in a cylinder of bark and sailcloth, was returned from central Africa to England, arriving the following year. The explorer's many friends and admirers thought the body should be interred in Westminster Abbey but this would be quite costly and the money was not immediately forthcoming from any quarter. When George Moore became aware of the problem, he offered to meet all expenses. This apparently shamed the Government into promising to meet the funeral expenses but it was George Moore who paid for the inscribed black marble tablet laid down some time after the ceremony. Just another one of his many acts of munificence that has gone largely unrecognised. This black marble tablet with its lengthy inscription (complete with spelling mistake)* was paid for by George Moore and replaced the original, much smaller memorial. * Spelling error in above inscription: "ULALA" should read "ILALA"